Last summer, for reasons that are still unclear, we found ourselves on a trip to Japan, inside a Yokohama shrine devoted to the achievements of Momofuku Ando, better known as the Father of Instant Ramen. Cup Noodles Museum, as it is known, is fully committed to Ando hagiography, right down to a recreation of the backyard shed in Osaka where the man invented chicken ramen in 1958. Ando’s yellow flash-fried bricks immediately inspired awe, we learned, and later a billion-dollar industry, and later still a near-universal revulsion for Ando’s suicidal brew of fat and MSG (although he himself ate the stuff just about every day and lived to be 96). In short, it was a phenomenon. Those plastic packages of Maruchan and Nissin might not have contained great ramen, but they whetted the appetite of the whole world for the real thing, and these days the lines in front of ramen shops like Ichiran in Tokyo are no longer than the ones outside Ippudo in New York’s Greenwich Village. 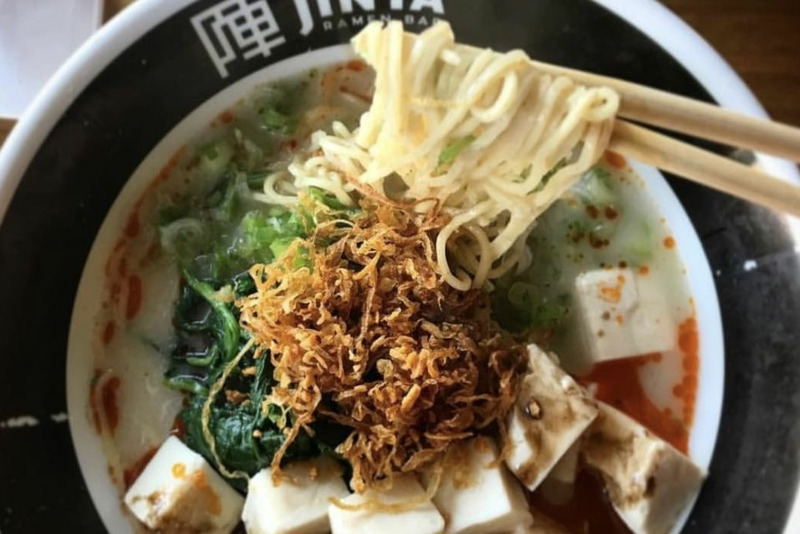 Ramen’s latest conquest—as evidenced by the lines—is an unlikely metropolis by the name of Webster, Texas, where Jinya Ramen opened in October (although a takeover of downtown Houston seems imminent, with a second Jinya scheduled to open on Louisiana St. this month). 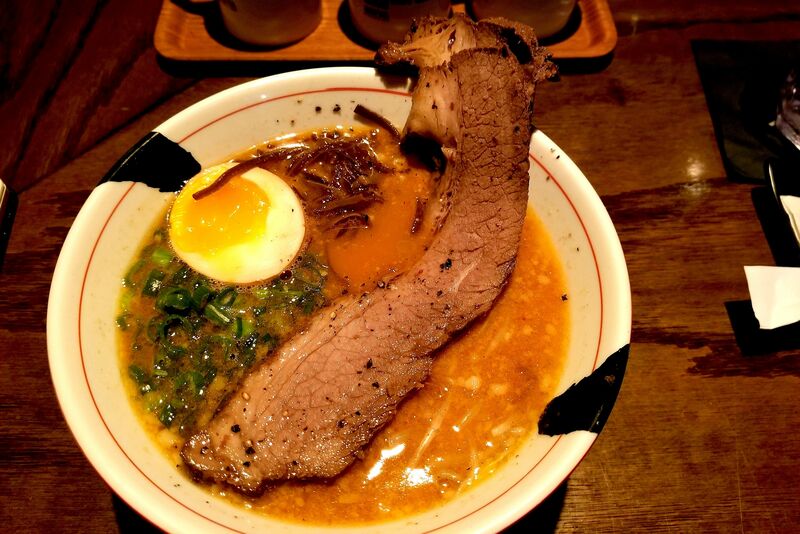 Tucked in a strip center between a resale shop and a tattoo parlor is quite simply the finest ramen shop in Houstonia, a place that’s every bit the equal of the finest noodle joints in the country. In a way, comparing Jinya’s offerings with those of other ramen places in this town is unfair, if only because most haven’t quite perfected tonkotsu, the rich, milky broth that Jinya specializes in, a soul-pleasing substance born of long-boiled pork bones. 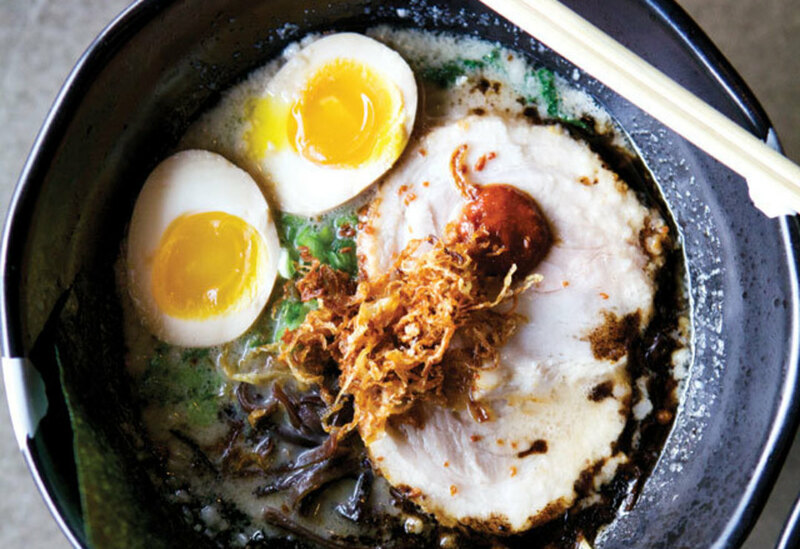 One has not had ramen, we humbly submit, until one has had tonkotsu, and Jinya’s are all terrific, from its thin-noodled black tonkotsu, with flavorful bits of kikurage floating on top, to the assari tonkotsu, whose thick noodles dwell in the depths below a meltingly tender pork belly. These modestly priced bowls of noodles—neither tough nor limp—can be customized with everything from broccoli to bean sprouts, from extra nori to extra noodles, and all for just a buck or so extra each. Enjoying ramen as the Japanese do, seated among strangers around a communal table, doesn’t add anything to the flavor of the soup, but then ramen has always been about much more than its flavor. Accordingly, Jinya’s centerpiece is a large rectangular bar with room for a few dozen diners, a bar barely wide enough for the enormous soup bowls served atop it. 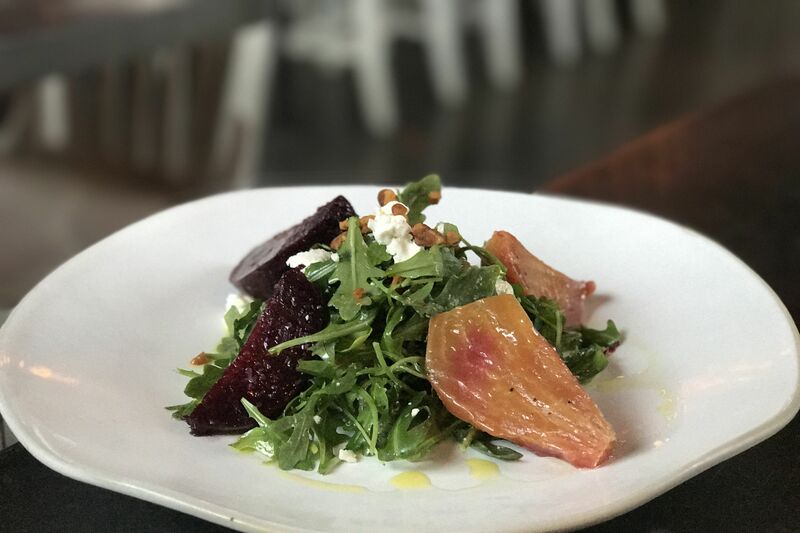 Otherwise, from the mod light figures to the goldenrod walls, the atmosphere is cozy yet stylish, perfect for savoring one’s meal to the fullest, and not just the ramen. At Jinya, you’ll also want to order the takoyaki, a long tray of griddled dumplings made with diced octopus and green onion, every one of which is sprinkled with bonito flakes, torpedoed with a skewer, and not long for this world once you’ve had a bite. Similarly irresistible is something called creamy shrimp tempura, another appetizer, and while the tiny pillows of pork gyoza are a distinct disappointment, the brussels sprouts tempura is a happy surprise. And whatever the path you take to it, the green tea mochi ice cream makes for a brisk, satisfying finale. Jinya, it must be admitted, is an LA-based chain, and for that reason there are those who will dismiss it outright, just as they once dismissed Momofuku Ando’s backyard creations. Sadly, it seems, the only thing proliferating faster than the number of ramen shops at present is the number of ramen snobs. We won’t be building a shrine to those guys anytime soon.